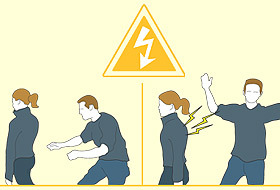 I think that the perfect self defense street weapon was just invented.Yes is true, now womens can be safe anytime with this new "weapon".At a first glance looks like an ordinary fashionable women's coat.But inside is an amazing power.The wearer can activate a switch in either palm that blasts an 80,000-volt electrical pulse through the jacket's material.Other self defense weapons as sprays, can be grabbed from a woman and used against her, but with this jacket you untouchable.Anyone touching the jacket gets the unknowing shock of their life while you remain nice and cozy in the self-defending cover.This coat is made by No-Contact - Clothing for women. scary indeed! lol but what about for weak men like me? is there any jacket that would prevent weaklings from robbery?